Staff was helpful, thoughtful, compassionate, “a friend”, very informed. The facility excelled in size and cleanliness, the arrangements fit our need perfectly. Everyone was so compassionate and very helpful. I felt that each director, assistant and employee was there for “us”. My loved one was handled in a very kind and dignified manner. I felt every detail was perfect. Your staff is excellent and I would recommend your facility to family and friends, all staff are very friendly and professional. My husband was very ill for over 10 years. Wondrous job on his appearance it was easier on all of the family to see him. Our family members called and received respectful interaction no matter what they asked. Thank you. We have lived in Stone Mountain for 45 years and appreciate local businesses and try to show support whenever possible. Thank you kindly for the snowflake ornament in honor of my husband. It is very special. I attended a friend’s funeral and was pleased with the funeral home. I promised myself that this was the right place for the future. I have also already recommended you to others and will do so again, well pleased. Thank you. We had a complication of having an elderly relative out of state. The staff were extremely knowledgeable and led us through this process and made it as smooth and low stress as possible. Your explanation of the cremation process helped us understand what would happen since this was all new to us. I really liked the information we got, the checklist of who to notify was a huge help to us. I had forgotten an item and you generously gave us one and refused to charge us, that was so kind of you. The location has a very nice atmosphere. Thank you. We were treated as if we were part of the Wages family and your kindness and support were much appreciated. My family has used Wages for many years. This was the 3rd family funeral I have planned with you. Everything has always been outstanding. Everyone is easy to work with. It was like talking with a friend, yet very professional. I recommend your funeral home to others without hesitation. Thank you for what you do and the services you offer. 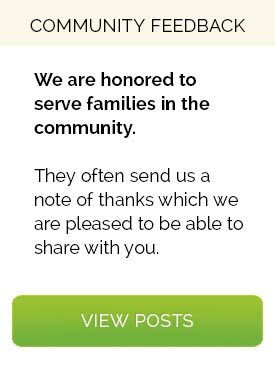 Not many people realize and/or appreciate how you (individually or as a company) contribute to the lives of others and the families that have lost loved one — but i do! The funeral director could not have been better. I recommend Wages & Sons to all family members and friends. You were great. You made everyone comfortable during a very sad time. The facility is beautiful and we have chosen you for a lot of our family. Everyone is helpful and professional. The staff is caring and compassionate. Thank you Jeffrey, for making a very difficult time better. Everything was handled efficiently and professionally. The staff is extremely cordial and accommodating. They make everything easy during a difficult time. Completely satisfied with the staff and all the advice and recommendations that they provided. The memorial service and reception were excellent. 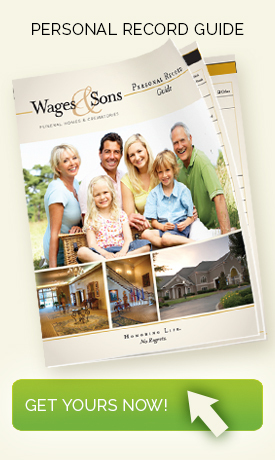 Wages & Sons has taken care of several of our family members and each time it has been a positive experience. The staff is very nice and understanding. The staff went above and beyond! Extremely friendly during a difficult time. The staff is extremely professional and knowledgeable. You really helped make the process move smoothly. You did an extremely great job during such a difficult time. Thank you! Everyone was very nice, that made it all easier. They were genuinely interested in our families’ wants and needs. You exceeded my expectations. I chose Wages & Sons because of the professionalism displayed by the staff. Great staff – very helpful and considerate. My family received very personal assistance and the entire staff was wonderful!. I chose Wages & Sons because of their professionalism, attention to detail and communication. Everything was handled beautifully. Thank you.